I love feeding the birds in the winter time. Last year I bought cheap birdseed and attracted loads of birds. This year I wanted to attract some different birds and prettier birds too so I invested in a bag of really good seed...peanuts, sunflower seeds, etc. The birds have been LOVING it too! Recently though, I have noticed that the birdseed level has been going down quickly and I wasn't sure why. There were tracks in the snow showing an animal had been in the backyard but I didn't know what kind of animal. Sooo, the other night we were eating dinner when my 5 year old exclaimed loudly "Look!! There's reindeer out there!!!!" I looked out the window and my backyard had 8 deer in it. 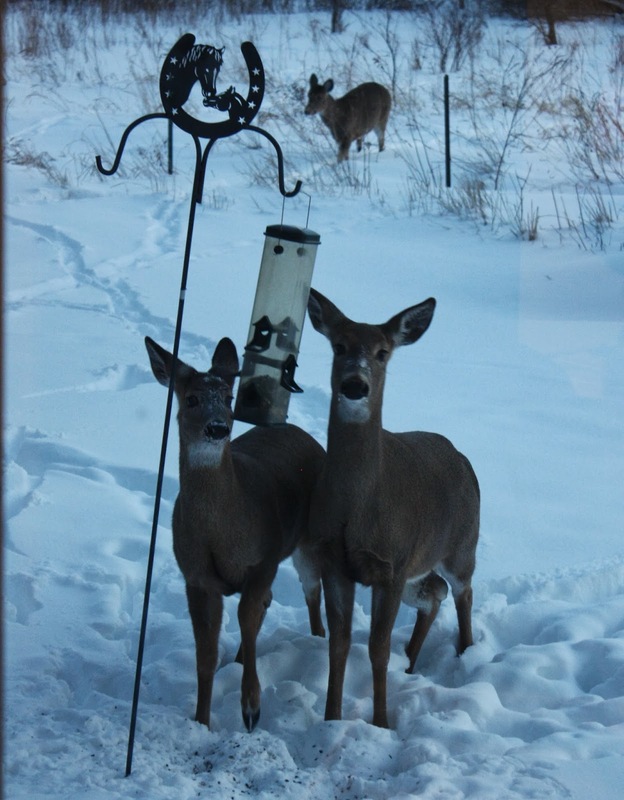 AND, what do you know...there are two deer standing at my bird feeder, head-butting the feeder trying to get the seed out. Oh goodness. I was shocked to say the least.